Download ": Chief Executive Officers of all Licensed Commercial Banks, Primary Dealers, Central Depository Systems (Pvt) Ltd. and LankaClear (Pvt.) Ltd."
1 March 29, 2006 BCP Guidelines No: 01/2006 To : Chief Executive Officers of all Licensed Commercial Banks, Primary Dealers, Central Depository Systems (Pvt) Ltd. and LankaClear (Pvt.) Ltd. Introduction Guidelines on Business Continuity Planning 1. Financial sector is an interdependent network of financial institutions, markets and systems. Fast advancement of technology and sophistication of financial products and systems have made financial institutions 1) (FIs) vulnerable to operational risk caused by inadequacies or failures of internal processes, systems and external events including natural disasters. Therefore, a failure to manage operational risks may expose the FIs to significant losses. There is a growing interest internationally among regulatory bodies and FIs to strengthen Business Continuity Planning (BCP). Basel II framework has identified operational risk of banks as a distinct risk category (in addition to credit risk, interest rate risk and liquidity risk that financial institutions take in return for an expected reward), which exists in day-to-day operations. Therefore, supervisory authorities in many developed countries and Bank for International Settlements (BIS) Committee on Payment and Settlement Systems (CPSS) have recommended 10 Core Principles for Systemically Important Payment Systems (Principle VII Security, Reliability & Continuity), BIS/International Organization of Securities Commissions (IOSCO) Recommendations for Securities Settlement (recommendation 11 Operational Reliability) and Recommendations for Central Counterparties (recommendation 7 Operational Risk) to cope effectively with the consequences of operational risk in payment and securities settlement systems. 2. 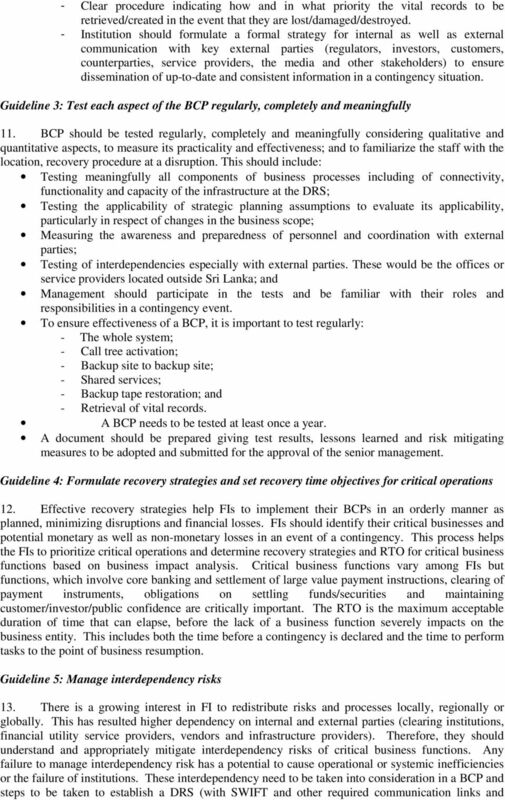 Having considered the consequences of systemic risk which could be caused by disruption to operations of participating institutions (PIs) of LankaSettle System, which is the systemically important payment and settlement system, the Central Bank of Sri Lanka (CBSL) advised PIs to have proper business continuity plans in order to achieve consistent level of resilience in LankaSettle System. Accordingly, CBSL requested PIs to submit their BCPs to CBSL by end March, Since most of the BCPs forwarded by PIs were incomplete or applied a multitude of standards of their own, CBSL held one to one meeting with each PI during the period of July to August 2005 to explain the required standard of BCP, and requested to submit revised BCPs to CBSL before the end of August, Since a number of PIs requested CBSL to provide written guidelines on BCPs and the fact that CBSL also desires to develop a consistent framework for BCPs, the CBSL has prepared a set of guidelines. 3. 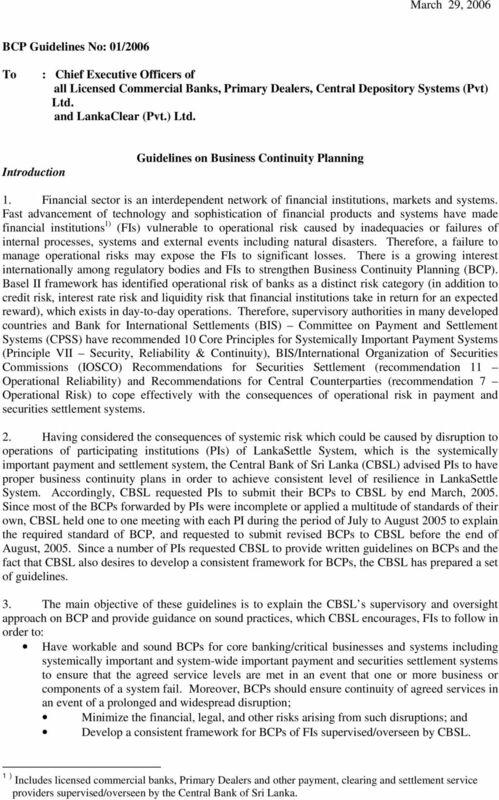 The main objective of these guidelines is to explain the CBSL s supervisory and oversight approach on BCP and provide guidance on sound practices, which CBSL encourages, FIs to follow in order to: Have workable and sound BCPs for core banking/critical businesses and systems including systemically important and system-wide important payment and securities settlement systems to ensure that the agreed service levels are met in an event that one or more business or components of a system fail. Moreover, BCPs should ensure continuity of agreed services in an event of a prolonged and widespread disruption; Minimize the financial, legal, and other risks arising from such disruptions; and Develop a consistent framework for BCPs of FIs supervised/overseen by CBSL. 1 ) Includes licensed commercial banks, Primary Dealers and other payment, clearing and settlement service providers supervised/overseen by the Central Bank of Sri Lanka. 4 Back Office, building/premises, human resources and communication) who would direct the recovery operations. 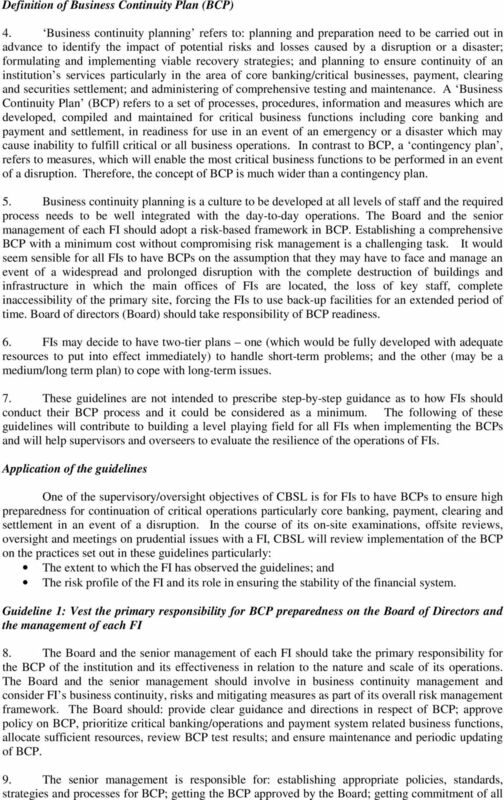 FI must develop, implement and maintain a BCP document, which provides guidance for crisis management procedure and information, which enable the senior management of FI to respond to disruption and recover critical businesses in a contingency event to avoid contagion effect on business of the FI as a whole. The dimension of a disruption is another important element to be considered in identifying scenarios. The best practice is for senior management to identify all plausible crisis scenarios including disasters covering a wide area, transportation, telecommunication, key personnel, payment system and other key infrastructure and develop crisis management process and procedures. Scenarios should be documented and revised when regular business impact analysis requires them to be changed. 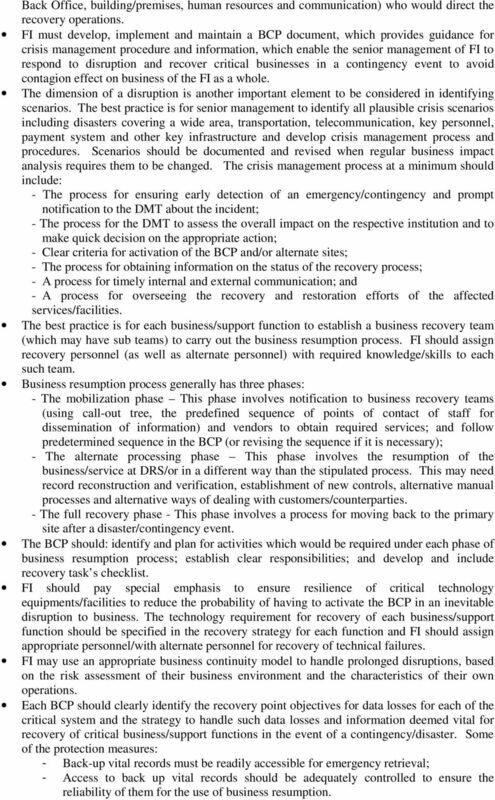 The crisis management process at a minimum should include: - The process for ensuring early detection of an emergency/contingency and prompt notification to the DMT about the incident; - The process for the DMT to assess the overall impact on the respective institution and to make quick decision on the appropriate action; - Clear criteria for activation of the BCP and/or alternate sites; - The process for obtaining information on the status of the recovery process; - A process for timely internal and external communication; and - A process for overseeing the recovery and restoration efforts of the affected services/facilities. The best practice is for each business/support function to establish a business recovery team (which may have sub teams) to carry out the business resumption process. FI should assign recovery personnel (as well as alternate personnel) with required knowledge/skills to each such team. Business resumption process generally has three phases: - The mobilization phase This phase involves notification to business recovery teams (using call-out tree, the predefined sequence of points of contact of staff for dissemination of information) and vendors to obtain required services; and follow predetermined sequence in the BCP (or revising the sequence if it is necessary); - The alternate processing phase This phase involves the resumption of the business/service at DRS/or in a different way than the stipulated process. This may need record reconstruction and verification, establishment of new controls, alternative manual processes and alternative ways of dealing with customers/counterparties. - The full recovery phase - This phase involves a process for moving back to the primary site after a disaster/contingency event. The BCP should: identify and plan for activities which would be required under each phase of business resumption process; establish clear responsibilities; and develop and include recovery task s checklist. FI should pay special emphasis to ensure resilience of critical technology equipments/facilities to reduce the probability of having to activate the BCP in an inevitable disruption to business. The technology requirement for recovery of each business/support function should be specified in the recovery strategy for each function and FI should assign appropriate personnel/with alternate personnel for recovery of technical failures. FI may use an appropriate business continuity model to handle prolonged disruptions, based on the risk assessment of their business environment and the characteristics of their own operations. 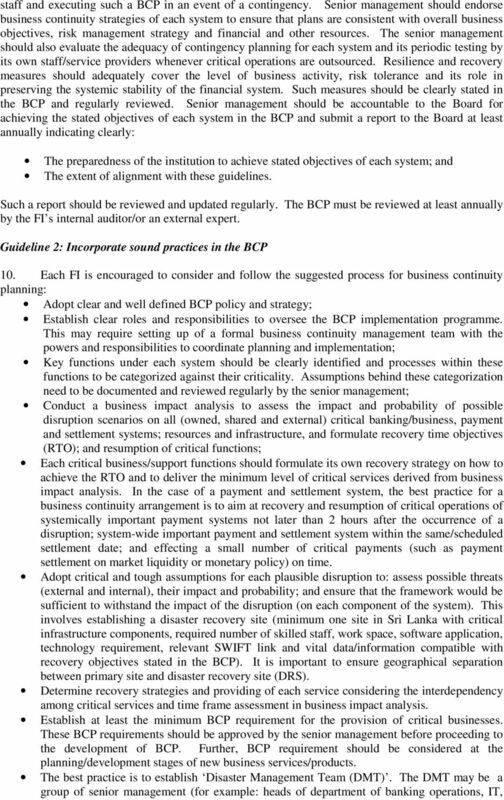 Each BCP should clearly identify the recovery point objectives for data losses for each of the critical system and the strategy to handle such data losses and information deemed vital for recovery of critical business/support functions in the event of a contingency/disaster. Some of the protection measures: - Back-up vital records must be readily accessible for emergency retrieval; - Access to back up vital records should be adequately controlled to ensure the reliability of them for the use of business resumption.